When you think of the services that your dentist provides, you probably imagine checkups and cleanings. Maybe you need the occasional cavity filling or restorative treatment. However, your dentist can help with more than just damaged teeth. Your dentist is an oral health specialist, so when you experience an issue like jaw pain, you should talk to your dentist. Conditions like bruxism and temporomandibular joint disorders can wear down your teeth and cause you pain. Your dentist can provide solutions for these conditions. What Is Bruxism and How Does it Affect Me? Bruxism is a condition that affects many Americans, and often, people don’t even realize they have the condition. Bruxism manifests itself as unconscious teeth grinding. Without knowing that you’re doing so, you may grind your teeth as you sleep. Bruxism is often triggered by high levels of stress or a structural misalignment of your bite. Grinding will wear down your teeth over time. It can also create cracks in your teeth from the pressure. You may experience jaw pain or headaches as a result of the condition. 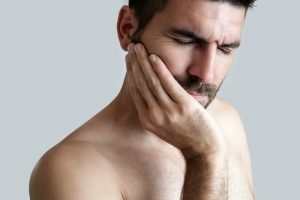 What Is TMJ and How Does it Affect Me? Temporomandibular joints (TMJ for short) are the pivot points of your jaw. When you experience a negative condition that affects these joints, it is typically referred to as TMJ disorder. Your jaw bone relies on these pivots to move as you talk or chew food. When these joints become damaged, misaligned, or inflamed, it can cause a number of symptoms, like headaches, popping sensations, and general jaw pain. Over time, you may experience difficulty moving your jaw as a result of TMJ disorder. What Solutions Are there for Bruxism and TMJ? In both cases of Bruxism and TMJ, talking to your dentist is the first step. Your dentist can check for signs of these conditions, often noticing premature wear on your teeth. In both cases, your dentist can typically create a custom-fitted oral appliance to help alleviate the condition. Similar to a mouthguard, the oral appliance is something you would wear as you sleep. It can help push your jaw into alignment or protect your teeth from grinding throughout the night. You won’t be able to experience relief for these conditions until you talk to your dentist about them! If you’re experiencing any oral health condition or pain, you should talk to your dentist about it. He or she can help you overcome these conditions, improving your experience and the quality of your sleep. Cedar Dental provides patients with the care they need for all kinds of oral health issues. If you’re experiencing jaw pain, contact Cedar Dental in Cedar Rapids, IA at 319-364-7108 to schedule an appointment today.